Join us on this brand new challenge for 2019; a ride through rural northern Greece. We'll ride for 4 days through untouched mountain scenery, traditional rustic villages, along unspoiled coastline, experiencing a part of Europe that most tourists have never seen. But also dropping in at some of Greece's most historic and stunning natural and cultural highlights. Our adventure begins on the idyllic Ionian Coastline at Preveza. With convenient flights it will make outbound travel simple for riders. Upon arrival we'll have an evening to explore the waterfront before prepping our bikes ready for the ride out the next morning. 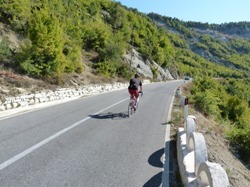 The ride starts proper as we head away from Greece's popular and well known coastline - but we are heading inland. We'll begin our gradual climb up into the Pindus mountains, through ancient villages, endless olive groves, and of course the occasional hairpin. We'll be using primarily singletrack roads, ensuring that we should have the tarmac to ourselves, only sharing with the occasional goats as we get deeper into this wild mountain range. Our first night will be spent in the fortified town of Ioannina, on the beautiful lake of the same name. Day two sees us climb up to the highest point on the ride, before cruising down an epic descent to the other-worldly landscape of Meteora and its world famous cliff-mounted monasteries. This is certainly a highlight of this ride - as we have the chance to ride the circuit of the stunning rock formations. The next day is spent leaving the mountains behind us, crossing the coastal plains all the way to the Aegean sea and its myriad of pretty fishing villages, all in the shadow of the iconic Mount Olympus, home of the Greek gods. Our overnight is in the pretty trailhead village of Litoxoro, often used by mountain trekkers and climbers. Our final riding day takes us along the coast, through rolling vineyards and olive groves, all the way to the historic city of Thessaloniki. A cultural crossroads, and legendary port from the days of ancient Greek mythology. We'll finish our adventure by exploring what this incredible city has to offer, especially its fantastic food and wine! Day 1 - : Arrive to Preveza. Check Bikes. Day 6 - : Fly home. We will be accomodated in comfortable hotels in twin and triple rooms. Single supplements are available, please ensure to request these at time of booking. Due to the nature of rural Greek mountain roads, we recommend a minimum tyre size of 28mm - with puncture protection, as there will be sections of rough tarmac, and possibilities of short gravel sections. Airport transfers (dependant on flight times Adventure Cafe will be able to collect you and your bike from the airport). We can expect calm and clear weather; make sure you pack sunscreen and sunglasses. As with any trip, we always hope for the best but plan for the worst. Particularly in the mountains the weather can change quickly; make sure you bring waterproofs and a warm layer for the descents.